Unique "Burst Pouch" of Perox-A-Mint solution premoistens swabs without the mess of mixing or dipping. Mouth moisturizer re hydrates oral mucous after each cleaning. Water soluble agent is safe for residents receiving oxygen. 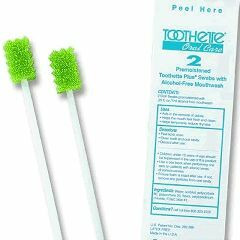 The Toothette Plus Oral Swabs with Mouth Refresh Solution are pre-moistened disposable oral brushes that clean and refresh your mouth. These alcohol-free swabs have a pleasant mint flavor that leave a clean, fresh feeling and help reduce halitosis. The Toothette Plus Oral Swabs feature soft, secure foam heads with distinct ridges that gently lift and remove debris and mucus from the oral cavity, stimulate oral tissue and help clean between the teeth. 2 pre-moistened swabs per pack. Toothette® Oral Care contains only proven, effective cleansing solutions. Great for oral hygiene. Use as a toothe brush. Clean Teeth. Smell good. Cleans Hard To Reach Spots. Easy To Use. Gentle On Gums. Clean mouth often. Daily Use. Bad Breath. Prevent Cavities. use frequently to keep mouth clean and breath smelling good. Cleans Hard To Reach Spots. Clean Teeth. Gentle On Gums. Durable. Easy To Use. Wife has feeding tube and mouth gets dry helps her cope with that. Durable. Good Value. Gentle On Gums. Easy To Use. Cleans Hard To Reach Spots. Clean Teeth. Gentle On Gums. Easy To Use. Durable. My husband has been unable to brush his teeth for several years and fought us constantly when we tried to brush them. These toothettes are great, they already have the solution in them and it tastes good (I tried one to be sure). Wish it came as a single with the solution in it. I bought this product about 1 month ago. and then, throw away the case box which tells the expire day. I wonder how long can I use this product. Please let me konw. There is no expiration date on the box or on the individual swabs. I buy them 200 at a time and use 1 per night with my 4 year old son and have never had a problem.